Playing is a great way to explore a new purchase, and playing with this poinsettia die from Poppy Stamps makes me very happy. After using traditional red for the first card I shared using it, I decided to explore a non-traditional option. If the white space of the first card freaked you out, this version should be more to your taste. The card is smaller (3.25" x 6.5") and utilizes a huge sentiment from Winnie & Walter's The Big, The Bold, The Merry. In the red version, the poinsettia die took center stage, but here it's definitely supporting cast. That bold merry, with its pretty loops and swishes gets the focus. I adore this card, and not just because periwinkle is one of my favorite colors. The hint of black in the word Christmas anchors the whole light and pretty design. I also pulled out pigment inks for this one. They give a little more weight and opacity to the stamped images, which is important, I think, in such a light design. Keep in mind the rules of play...have fun and don't worry if you make pretty trash! Sometimes, play works out, and sometimes it doesn't. But if you turn off your inner censor/critic and let creativity happen, you just never know what will happen! The crazy is ramping up at my house as we get ready to send our elder son to his first year in university, our younger son to tenth grade, and me to work. My time to stamp is predictably limited right now. Once the boys are settled, I will have more time (despite the work) to stamp and will get back to regular posting. Until then, I will post when I can. Thanks for your patience! I picked up a Poppy Stamps layered poinsettia die at Marco's Paper a while back, and decided to play around with it, seeing as I'm not terribly experienced with dies and this is a particularly pretty one. Card Size 3.5" x 7.25"
The poinsettia comes with three layers, but that seemed too much for my CAS-lovin' self, so I used two...one in cherry cobbler and one in real red (both colors by StampinUp). For those of you who like more layers, adding the third smallest layer in the cherry cobbler would be lovely! The sentiment (Papertrey's Side-by-Side Sentiments) was stamped in Brilliance pearlescent ivy, which is a nice, dark green. As you can see in the close-up, the dies deboss veins into the leaves. There's also a leaf to go with the poinsettia, but I usually don't like having red and green touching, so I skipped the leaf here. But side by side, red poinsettia and green sentiment, they look festive! I like to decorate my Christmas card envelopes, so this one is stamped with a Hero Arts poinsettia from Holiday Sentiments. The center of the stamped poinsettia has gold gel pen as an accent since bling on an envelope is impractical. Also, the lines are from Simon Says Stamp's Envelope Sentiments. There's a LOT of white space on this card, perhaps more than most of you would be comfortable using. That's okay. You could adapt this concept to a much smaller card or even on a gift tag. Simple sentiment, one poinsettia, one bling. Rearrange as needed to please the eye. Easy to mass produce. Striking and pretty! My interview went beautifully, and I am now an adjunct instructor at our area's largest community college. I will be teaching two sections of English Composition 1. Many, many thanks to all who have sent good wishes and encouragement in this, and for all who have prayed. I've felt it all and am beyond grateful. Today's card has a bibliophile theme and takes me outside my comfort zone with a colored card base. No matter how hard I tried, the raised panel just wouldn't look good on a cream base. Nuh-uh. Not at all. After I'd edited the photo, it occurred to me that the banner with pointy ends really doesn't go very well with the soft deckle of the watercolor paper and the soft edges of the inked background. Wish now I'd used a deckle on one side of the banner. Oh, well, this is why we keep stamping. Always striving to improve and "get it right." If we ever do attain perfection, what's the point of going on? Well, perhaps that's too strong. Yesterday's card was pretty perfect to my eye, LOL! Anyway, I made the background using an old Hero Arts shadow stamp inked up with peeled paint and faded jeans, spritzed with lots of water, and stamped on watercolor paper. The edges are particularly uneven because I spritzed too much water, but I like the results. The color is nicely intense anyway. Books do make me happy. If you like reading novels, may I recommend Eleanor Oliphant Is Completely Fine by Gail Honeyman? It's the best novel I've read in months. And I read a lot. It's annoying when you ink up an image, stamp it, and get this. Hero Arts dye inks tend to smooth out as they dry, but not this time. This stamp and the ink (robin's egg) are from Hero's February 2018 kit. After rubbing the stamp with an eraser, cleaning it well, and re-inking it, this happened. Grrrr. So I decided to use an Archival ink (cornflower), which is oil based and generally provides perfect coverage, but this happened. Well, isn't that special? (Reread that question in the Church Lady's voice.) I cleaned the stamp again very well, re-inked, and this happened. To get a bit of height on the label, I stacked three die cuts together. That gives some lovely--and solid--dimension that won't crush in the mail. The Hero Arts February 2018 kit is lovely, but that robin's egg ink is finicky. This has happened before. I love the color but wonder if there's something wrong with the formula. The Hero Arts raspberry jam ink looks great on the flowers with no rubbing of the stamp necessary. Oh, well. Archival cornflower certainly works great! 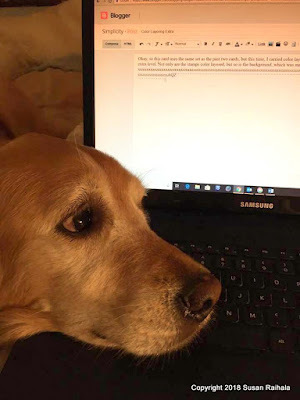 Well, Daisy helped me blog there. Dog chins are not literate. Which begs the question: is my chin literate? Things to ponder. Yes, I petted her. She has me well trained. Anyway, I made the background by lightly inking a scrap with tumbled glass Distress Ink and an inking tool. Then, I placed a stencil over the scrap and added more of the same ink to create the graduated dots. Let me also point out, just for the record, that today's seahorse uses three shades of orange, yesterday's used three shades of aqua, and the first card used three shades of purple. That's nine shades of dye ink...not counting the inks on the shells. If I didn't have so VERY MANY ink pads, using color-layering stamps would be so much harder. Just sayin'. If you need a reason to buy more ink pads. It's no secret that I'm a fan of white space and don't care too much if my focal point floats around in that white space. I'm a amateur, not a professional designer, and violating those rules about grounding doesn't keep me up at night. But when I saw the top left card on this pin, I wanted to experiment with speckles as a way of grounding my fabulous aqua seahorse. Isn't he just darling? The inspiration card uses more than just speckles, of course, to ground its seahorse-y scene, but I rather like how the speckles look all by themselves. My use of three elements, with the shell and starfish set slightly apart from the seahorse, creates a visual triangle (emphasized by the rhinestones) which allows the small sentiment to stand out a bit more. The speckles were made using StampinUp's old, old, old Itty Bitty Backgrounds. To get the distribution right, I stamped a few, laid the elements down to see how it looked, picked them back up, stamped some more...and repeated until it looked good. And there you have it. Another three-step color-layered image that makes me happy. One more seahorse card is coming your way, and then we shall move on to other stuff. Thanks for listening to my struggles with multi-step stamping. It seems that Hero Arts is scaling back on the number of layers in its newer releases, which makes me happy. My limit for future purchases is definitely three layers, with two preferred. Let's keep things relatively simple, shall we? As for the job search, Dr. Nancy West, one of my graduate school professors, graciously talked with me today, offering up encouragement and some wonderful advice for Wednesday's interview and for my return to teaching. She definitely made me feel more confident and more centered. I'll keep you posted! Before we get to today's card, I have to share the good news! This afternoon, right after I bought "professional" (read "uncomfortable") shoes to wear with an interview outfit, I received an email asking me to come into a college next week to discuss my availability for this upcoming semester! Woohoooooo! Thanks to all who have prayed or sent good wishes my way on this. Let's hope it all works out. I am so very, very ready to return to teaching composition and literature! And now to a color-layered image that has THREE stamps to it, which is my upper limit on color layering. Not sure why this Hero Arts seahorse makes me so happy, but it does. Before my MISTI, I struggled with lining up the third layer, but with my MISTI, it's relatively easy to line up. As you may know, I almost never Copy-And-Steal-Everything (CASE) from a source of inspiration, but this card is VERY close to the original, especially in the placement of all the elements, mainly because the original is such a perfectly executed design using the exact same Hero Arts set. My colors are different (though still pastels), and my sentiment is on the card base rather than on a strip over the background paper, but otherwise, it's pretty much the same as Mariana Grigsby's original card. She used designer paper for her background, but I stamped the wavy lines from Papertrey's Ombre Builders set, which always make me think of water. Many, many thanks to Mariane for the AWESOME inspiration! Many stamp companies are coming out with color-layering stamps...images with two, three, four, or 14 separate stamps to give a life-like and vastly more interesting look to flowers, animals, scenery, and such. These used to be called (by StampinUp, at least) two-step stamps, back in the day when all good-quality stamps were red rubber mounted on wood. I hated two-step stamps. Even when I used a good stamp positioner, the images NEVER turned out right. Two-step rubber stamps were (for me) an exercise in frustration and wasted paper. Then photopolymer stamps became all the rage, the idea being that they would be EASY to line up for multi-step stamping because you could see right through them, and golly gee, isn't this amazing? Except they weren't. Well, they were better than red rubber but not good enough. My hands are pretty steady but not steady enough to line up many two-step stamps perfectly enough to satisfy my perfectionist eye. More frustration. More wasted paper. Until brilliant stamping gurus invented the MISTI. NOW it's supposed to be easy to do multi-step stamping. Well, sort of. Again, it's an improvement, but it's still not perfect. Either I'm loosening up in my old age, letting go of my insidious perfectionism, or I've just stopped caring so much. Lately, however, with Altenew's amazing floral layered stamps and Hero Arts' layered animals, this whole concept of color layering is reaching new levels of complexity and crazy. So I thought I'd weigh in on the subject as I'm certain there are other stampers out there whose experience parallels mine...and they will feel vindicated and comforted by my bumbling mistakes on this front in my war to be creative. Because it's war, folks. War between my Wish List and my Checking Account. Two sides in horrible, horrible conflict that leaves me bloody and bruised and wondering where everything went terribly wrong in my life. I knew things were nuts when I ordered the Color Layering Sea Turtle from Hero Arts. We'd been to Hawaii and snorkeled with a sea turtle, so the set called to me. Until I realized that the thing had not two, not three, not five, but THIRTEEN individual stamps to line up. Or, as I liked to call it after making a lot of trash, THIRTEEN OPPORTUNITIES TO FAIL. With a MISTI, it took almost 15 minutes of futzing for me to stamp a sea turtle...and it still wasn't perfect. The color-layering peacock isn't much better at seven stamps, and the rooster has eight stamps. The sea horse, however, only has three, and the octopus a delightfully simple two. Guess which sets I have kept. This octopus makes me so very happy, especially stamped in Hero Arts dark quartz and Papertrey's terra cotta. He's waving that tentacle to say hello, and darn it, he makes me smile. TWO STAMPS, people. And with a MISTI, he's incredibly easy to line up almost every single time. Also, the branching coral in the set is one of my favorite stamps ever. Not sure why, but it is so very pretty and the coordinating die makes it incredibly versatile, too. It looks great with the Hero Arts ombre inks, too. To make the water background, I rubbed an acrylic block with Tim Holtz distress inks (tumbled glass and mermaid lagoon), spritzed it with water, and stamped it onto Hero Arts handmade watercolor paper. The top panel uses a die (unknown) to create the window and is popped up using craft foam. The octopus is glued to the top panel and has dimensionals under him as well. The coral is popped using very thin dimensionals. So my first piece of advice as you consider purchasing color-layered images for stamping is this: don't buy sets that have tons of layers to create an image unless you have a high tolerance for imperfection and/or a lot of time and huge paper stash for making mistakes and starting over again. I woke up at 5:10 this morning in a panic over the job situation. Perhaps you know how it goes...your brain boards the Negative Train and, dang, that little engine can ruin sleep better than caffeine and police helicopters! So I got out of bed, made coffee, and read a book in an attempt to derail that sucker. Feeling slightly better (because coffee and books make everything better), I checked my email and received a lovely, positive, affirming prayer from reader Patti M., who recently donated a bunch of beautiful cards to Karen's Card Shop. With spring in my step and hope in my heart, I set about my day, which just ended with a doe and very tiny fawn cavorting across my back yard. So today's card is my version of a warm fuzzy shabby chic...without the warm or the fuzzy or the shabby or the chic. Okay, so I used Text Style askew. That counts, right? Gray and grape are such a lovely color combination. And now I'm off to the Land of Nod with a firm faith that whatever happens will be good, and I thank Patti for her confidence in God's plan and reminding me to rest in hope. Wow. Why do I always forget how much there is to do when we come back from vacation? We had so much fun kayaking, watching bald eagles and muskrats and loons, reading, swimming, eating walleye, and generally relaxing. 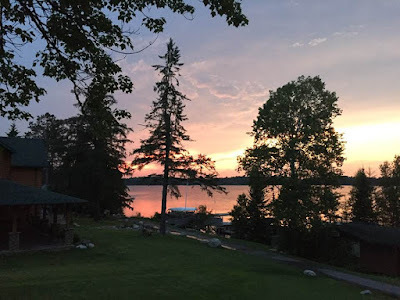 Of course, no Raihala family vacation at Lake Vermilion is complete until someone's gone to the Cook emergency room (George this time...ear infection), but otherwise, it was great fun. He's doing better, now. I, however, feel run ragged. And it's only Monday. Tomorrow afternoon, I'll have a little time to breathe and meditate and slow down before hitting the job hunt again. Next resume will be tailored for freelance/contract writing and editing jobs. I really, really hope a teaching job comes through, though. If you're the praying kind, please say a little prayer for that. Anyway, here's another card using Wildflower Garden from Altenew. Such a wonderfully versatile set. The colors are Hero Arts robin's egg and bird nest, both from the February kit. I put some pearls on there to add some dimension and shine...but not too much shine. Sympathy cards are always hard to make when you need them. I needed this one. Altenew's Wildflower Garden made making this card easier. Can you tell I love this set? The colors are soft and serene, but the movement of the stems adds interest and a bit of wildness to the design. Our time at Lake Vermilion is winding down. Friday will be our last full day, with an early departure on Saturday. We've had a lovely week, and as always, I'm sad to be leaving and happy at the thought of getting home. Here's last night's sunset from our cabin's deck, looking across the bay. The next few posts will return us to Altenew's Wildlife Garden, which is a lovely and versatile set. Today's card shows how you can achieve a lovely watercolor effect with these stamps. These stamps were inked with Memento inks and markers (StampinUp and Memento), spritzed with water, and stamped. I've found that, at least for me, Hero Arts and Archival inks don't respond as well to this technique. The stamped panel wasn't proportional to the card size, so I put the sentiment below the stamped panel. That placement also allows the plant to grow up out of the bottom of the panel rather than be floating above the sentiment. So this card provides a really good reason to have Memento inks and markers. As if we need a reason to have any supplies. Snowflake cards are perfect for practicing visual triangles. Today's cards do just that...one with a portrait layout and the other with a landscape layout. The three snowflakes on a strip of background are arranged in a visual triangle. I've noted before that the best triangles are irregular. Equilateral or isosceles triangles yield odd-looking designs. I placed the two larger snowflakes on the left and the smallest on the right; balance is maintained by the sentiment. The rhinestones reinforce the triangle. The background "grounds" the design, but note that the two larger flakes and the sentiment go outside the lines. That keeps the design from being too boxed-in and linear. Both backgrounds were applied with mini ink applicators from Tim Holtz. The colors were experimental. I wanted a snowflake card that wasn't blue, hence the pink. I really like it, but it doesn't say "Christmas" to me. Pink is also a high-energy color to my eye, and the sentiment calls for something more relaxing...like blue violet. My preference would be to make the blue-violet version in a portrait orientation. The triangle seems too spread out on the landscape version, at least to my eye. And that is all I have for Christmas in July, so reader Marilyn will be happy for me to abandon Christmas in July for something floral and summery tomorrow. We continue to relax on Lake Vermilion. I actually swam in the lake...first time in four visits since 2012 for this Girl Raised in the South, where lake water tends to feel like bath water. This summer, Lake Vermilion is warmer than ever, and I didn't scream like a little girl when I dangled my toe in water that was still ice at the end of April. Did y'all know that Dante made the lowest level of hell a frozen lake? Being raised in the South, I had always imagined hell as a hot, hot, hot. But then I lived on Lake Huron a few decades ago and learned that, indeed, Dante was right. I am currently in northern Minnesota in a cabin on Lake Vermilion. We find peace in so many ways, sometimes stumbling on it accidentally and sometimes working hard for it in our relationships, families, communities, nations, and world. It's also wise to cultivate peace deep inside of ourselves. Today, I went out on the lake in a kayak. Guaranteed peace. There's something about skimming gently over the water in a kayak that instantly relaxes me. Today, I had the added treat of encountering a loon with two babies. The adult loon started vocalizing that wonderful, eerie call. The trio was shortly joined by another adult, exchanging calls with the first. When the newcomer was about twenty feet from the trio, the two babies paddled like crazy toward the newcomer. The four then floated off toward the shore. This little reunion was so sweet, so gentle, so natural, so simple. What a blessing of peace on a day that started stormy and rough. Seek after peace and pursue it. Here's a third card with Holly's Snowflakes from Mama Elephant. Peace on Earth, Goodwill to All. Thanks so much to readers Marcia and Patti for donating their beautiful cards to Karen's Card Shop! Many of your donations are out in the shop right now. Karen's Card Shop has brought in over $1,500 for our church in two years and has funded Cancer--Now What? books, training materials for our Stephen Ministers, and our general fund. Thank you all who have contributed and continue to contribute. Patti and Marcia and all the others who help keep the card shop stocked prove that stampers are the best people in the world! Note: If you are interested in donating, please read the page Karen's Card Shop. We can always use thank you, sympathy, get well, birthday, and religious cards in a standard A2 size. Other themes don't sell very well. Please leave the insides of cards blank. Email me if you have questions! susanraihala at roadrunner dot com. So Hero Arts mastered the art of updating old supplies, packaging them coolly, and getting me to buy them even though I'd sworn never to buy another sequin ever again. At this rate, it will take three of my nine cat lives to use all these sequins. Maybe four. What supplies do you have in such quantities that you will need multiple cat lives to use them up? Inquiring minds, and all that. Happy Independence Day! May your day be safe and firework-y and full of food, family, and friends! Have you ever felt that life was getting out of your control? That you're moving from one fire to the next, pointing hoses and barely averting catastrophe before another fire pops up to distract you? Or maybe a better metaphor would be Whack-A-Mole. Yeah. That. I'm standing here in front of a table with moles poking their annoying little heads up for me to whack, but I'm always missing. That's my life right now. I might be just a tad melodramatic, but, well, I am. Anyway, with the little time I had to stamp this weekend, I made a red snowflake card. The stamp set is Mama Elephant's Holly's Snowflakes, which is simply a delightfully designed set with snowflakes of all shapes and sizes and ever so much fun to play with. The card started off one layer, but I stamped everything about a quarter inch too high and to the right. The finished result looked terribly off balance. Trimmed it down, centered it on a card base, and sighed happily. Maybe I can balance my life the same way, but it's more fun to simply split infinitives and mix metaphors. Off to whack some more moles. Content of this blog is intended for personal craft use only. Feel free to copy my cards to send to your Aunt Matilda or Grandma Jane, and feel free to make my day by telling me about it! Please don't steal my pictures or copy my cards for profit or contests or publication. All content of this blog is copyright (c) Susan Raihala 2017.